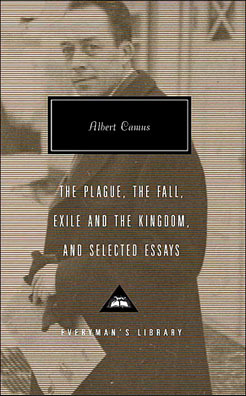 The Fall (1956) is a story by Albert Camus (1913-60), a French writer and philosopher, one of the founders of atheistic existentialism. This story had a strong impact on Holy Wood. Most obviously similar, the last section of Holy Wood is titled The Fall. The Fall is an accusatory confession in a sense, told by a "judge-penitent" Jean-Baptiste Clamence. "A false prophet crying into wilderness and refusing to come forth," Clamence is convinced that people are mean and vicious by nature, and thus there's neither salvation for them nor hope. Voluntarily or not, but this story became the Camus' last philosophical will. Manson referenced The Fall for the first time ever in his renowned essay Columbine: Whose Fault Is It? This essay was the artist's response to the American society which laid the blame upon him for the Columbine killings. In the end of the essay Manson wrote: "So don't expect the end of the world to come one day out of the blue - it's been happening every day for a long time." These words are a slightly paraphrased maxim of the main character of Camus' story. Reasoning about the Last Judgment Clamence concludes: "Don't wait for the Last Judgment. It takes place everyday." At the beginning of the essay the crucifixion of Christ is described as "murder-suicide," and this is the aftersound of another Clamence's theory, according to which the crucifixion of Christ was a suicide matter-of-factly. "Say, do you know why he was crucified", says Clamence to his interlocutor, "the one you're perhaps thinking of at this moment? Well, there were heaps of reasons for that. There are always reasons for murdering a man. <...> But, besides the reasons that have been very well explained to us for the past two thousand years, there was a major one for that terrible agony, and I don't know why it has been so carefully hidden. The real reason is that he knew he was not altogether innocent. If he did not bear the weight of the crime he was accused of, he had committed others - even though he didn't know which ones. Did he really not know them? He was at the source, after all; he must have heard of a certain Slaughter of the Innocents. The children of Judea massacred while his parents were taking him to a safe place - why did they die if not because of him? <...> Knowing what he knew, familiar with everything about man... brought face to face day and night with his innocent crime, he found it too hard for him to hold on and continue. It was better to have done with it, not to defend himself, to die..."
"Am I sorry your sky went black / [When you] put your knives in babies' backs?" The crucifixion of Christ, which was accompanied by a solar eclipse, mentioned in the first line of the song, and the second one is about Slaughter of the Innocents. "Why, a few streets from here there is a museum called Our Lord in the Attic. <...> But today - set your mind at rest - their Lord is neither in the attic nor in the cellar. They have hoisted him onto a judge's bench, in the secret of their hearts, and they smite, they judge above all, they judge in his name. He spoke softly to the adulteress: "Neither do I condemn thee!" but that doesn't matter, they condemn without absolving anyone. In the name of the Lord, here's what you deserve. Lord? He, my friend, didn't expect so much. He simply wanted to be loved, nothing more. Of course, there are those who love him, even among Christians. But they are not numerous." No less importance bears the theme of censorship. According to Manson the missing jaw of the crucified Christ portrayed on the cover of the album is a symbol of censorship. "With the artwork, I wanted to show people that the crucifixion of Christ is a violent image in itself. My jaw has been removed as a symbol of this exact type of censorship," said the artist in the Zero Music Magazine interview. "He was not upheld", says Clamence about Christ, "he complained, and as a last straw he was censored. Yes, it was the third evangelist, I believe, who first suppressed his complaint. "Why hast thou forsaken me?" - it was a seditious cry, wasn't it? Well, then, the scissors! Mind you, if Luke had suppressed nothing, the matter would hardly have been noticed; in any case, it would not have assumed such importance. Thus the censor shouts aloud what he proscribes. The world's order likewise is ambiguous".